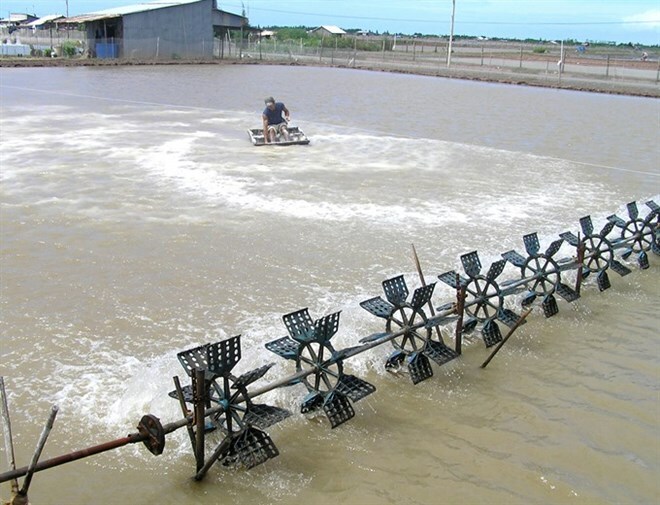 Rising sea levels have exacerbated saline intrusion and coastal erosion in Vietnam, but farmers can make the best out of a bad situation by shifting from agriculture to aquaculture, raising brackish water shrimp. Shrimp farming in the southern province of Bac Lieu. This view was expressed by the Directorate of Fisheries (DoF) at the fourth agricultural promotion forum held in the southern province of Bac Lieu on May 5. Attending the forum were leaders from relevant sectors, scientists and nearly 200 shrimp farmers from the Mekong delta provinces of Ca Mau, Soc Trang, Kien Giang, Tien Giang, Tra Vinh, Ben Tre, Long An and Bac Lieu. DoF official Ngo The Anh said at the forum that raising brackish water shrimp was a key target in the nation’s aquaculture development plans, especially in coastal localities. Anh said localities in the Mekong Delta needed to take advantage of all its potentials including natural conditions, available markets, processing technology and experience of local breeders. The DoF also informed the meeting that various Vietnamese shrimp products had high potential because they were favoured in the world market. There is currently no limit on shrimp products, because its price has almost never dropped. Truong The Hung, a shrimp farmer in Soc Trang province, said he and his peers were more concerned about the quality of post-larvae because they could not check this with the naked eye. Most shrimp farmers who expressed their views and opinions at the forum also mentioned difficulties they faced, including raising capital, disease outbreaks, the quality of post-larvae and veterinary medicines, which they said were hurting the shrimp breeding industry. Shrimp farmers suffered last year from drought and salinity, which damaged more than 188,000 ha of ponds in Ca Mau, Bac Lieu and Kien Giang provinces. In the early months of this year, Delta farmers raised shrimp on 556,000 ha, more than double the same period last year. Kim Văn Tieu, Deputy Director of the National Agricultural Promotion Centre, suggested the DoF continue to focus on managing the quality of post-larvae, probiotics and antibiotics, as well as products to treat the environment, in order to protect the rights and interests of shrimp farmers. “Research institutes, schools and businesses need to study and engage in the production of quality, disease-free post-larvae, and produce disease-resistant varieties in the future,” he said.